“We are living through a defining moment,” said keynote speaker Amal Clooney. 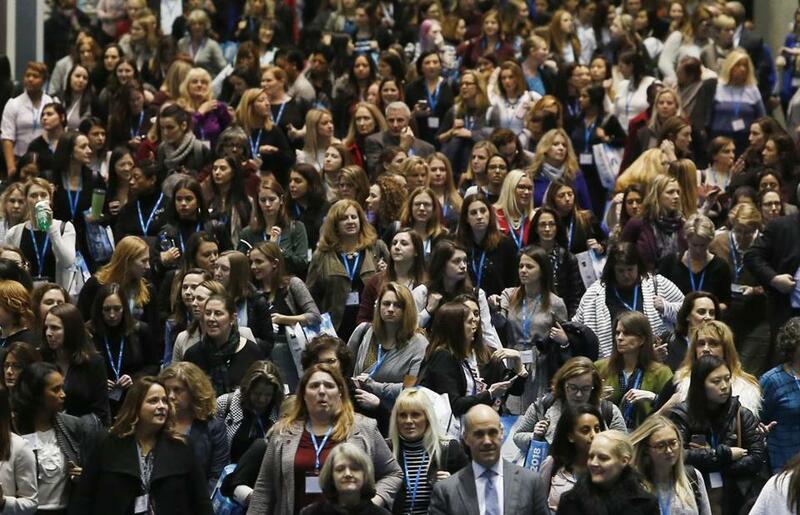 A year after the #MeToo movement exploded into American life, there’s reason to be optimistic that the work world is changing for the better, according to the executives and participants at the Massachusetts Conference for Women. But throughout panels and breakout sessions Thursday at the largest women’s conference in the nation, almost every statement asserting the victories that had been won was accompanied by the caveat that much more needs to be done. “I believe that we are living through a defining moment in the fight for gender equality,” said Clooney, addressing the 12,000 women gathered for the day’s sessions. Just having a panel focused on #MeToo is a sign of the continued influence of the movement. Last year’s conference took place just as the first wave of sexual misconduct revelations were toppling high-profile men including Hollywood producer Harvey Weinstein and former senator Al Franken, but there wasn’t a single session devoted to the #MeToo movement, even though it was widely discussed. This year, those who were committed to walking to the farthest meeting room from the cavernous exhibit hall, past a standing-room-only session on “Time Saving Hacks to Boss Up & Beat Burnout,”could spend an hour-plus digesting what the past year has meant to women’s place at work. A handful of men were in the audience. #MeToo “created a sense of urgency and realism,” said Laurie Knocke, senior employment counsel at Boston Scientific Corp., during the panel discussion on navigating the workplace in the wake of the cultural and political reckoning that’s unfolded in the past year. “I do think that the #MeToo movement has created the awareness to make that more real, to make it more imperative that we make sure we don’t have Harvey Weinstein in our midst,” she said. The allegations about him – when they finally surfaced in the press last fall – sparked the broader wave of revelations and consequences on sexual harassment through numerous industries. Attendees filed out of Thursday’s event. “We have much to celebrate. But let’s be honest: The pace of change is unacceptably slow,” said Kathy Horgan, executive vice president and chief human resources officer at State Street Corp., after highlighting gains in women’s representation on corporate boards and in Congress. “Gender equality and pay equity remain elusive goals. Sexual harassment, intimidation, and assault are far too prevalent,” she said, and despite gains, Congress and corporate America still aren’t very diverse. Several speakers worried about pushback to #MeToo in some workplaces, highlighted in a recent Bloomberg story about Wall Street executives refusing to mentor or dine with women for fear of getting smacked with an allegation of sexual misconduct. The article dubbed it the “Pence Effect” for Vice President Mike Pence’s self-imposed rule against sharing meals with women when his wife is not present. She said one CEO told her he used to take every new hire out to lunch, but has since stopped “because of what’s happened with #MeToo. I don’t want to be alone with a woman,” he told her. “I think that’s a really unfortunate aspect of the fear, is backing away” out of an instinct for self-preservation, Rezvani said. “What we should be doing instead is leaning into the difficult and uncomfortable conversations,” she said. An example: In another company, she heard from a man who stopped himself responding to a female colleague’s remark and admitted he was about to “mansplain” to her, and everyone was able to laugh about it. “I think that’s ridiculous. It’s weird that you would be scared to interact with people. Just don’t be a jerk . . . and you should be OK,” said Michael Sojka, a 26-year-old software programmer with PowerAdvocate, clarifying that is his personal opinion. “I think things have changed, for sure. I think there needs to be more change and whether it’s happening fast enough is a separate question,” said Sojka, who was in the audience that heard the #MeToo panel. 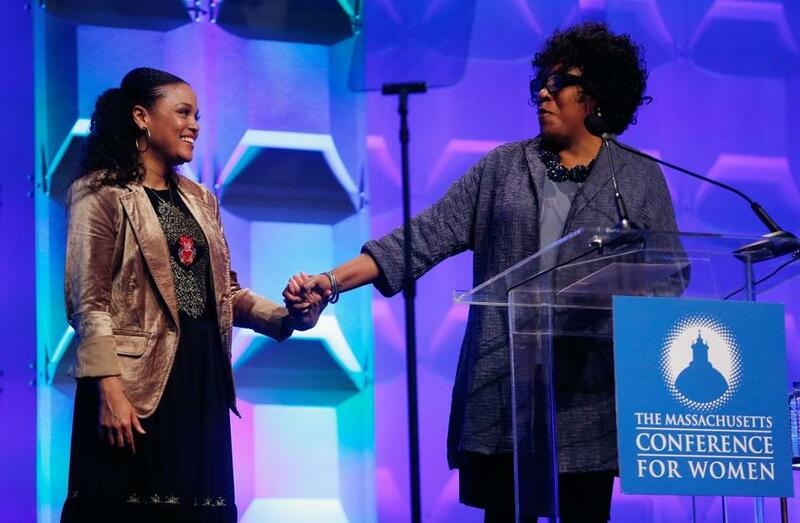 Author Jesmyn Ward (left) held hands with Karen Holmes Ward of Channel 5. Participants in the session pointed to specific companies they saw doing things right. Moderator Joanne Lipman, a journalist and author of “That’s What She Said: What Men Need to Know (and Women Need to Tell Them) About Working Together,” highlighted consumer products giant Kimberly-Clark Corp. for instituting a policy to always ask a woman if she’s interested in a promotion, regardless of whether colleagues think she won’t want it because she’s pregnant or her spouse won’t want to move or some other unconscious bias. Illustrating how male leaders are being influenced by #MeToo, Knocke recalled a meeting at her company in the past year. A male executive brought in his female sales team leaders to talk about the movement and how it had made him rethink what he’d been doing as a leader, including some specific situations where in hindsight he thought he had handled things inappropriately. Then he proceeded to walk through the scenarios and asked the women for their input on what he could have done differently. “It was truly eye-opening to everyone. . . . What it requires is men to be vulnerable,” she said. “More awareness,” chimed in Janel Juba, a corporate career adviser with Wentworth Institute of Technology, who was standing in line with Mondavi for a complimentary headshot. Both women pointed to another green shoot of change they’ve seen emerge in the past year – colleges helping outfit women, and men, with better skills to navigate the sexual politics of the workplace.